The title of the Star Wars spin off-film about the young Han Solo has been revealed as Solo: A Star Wars Story. 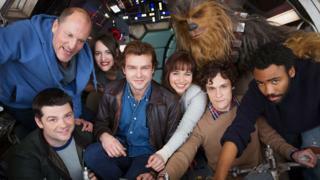 The movie will star Alden Ehrenreich as the title character alongside Donald Glover, Woody Harrelson and Emilia Clarke. Director Ron Howard made the announcement in a video shared on Twitter. He also said the movie had now wrapped and will go into editing. It's due to be released on May 25 2018. The film has already received a lot of attention after Howard took over from Phil Lord and Christopher Miller as director. They said their departure was down to "creative differences" with producers. Solo's title follows the "A Star Wars Story" format set by Rogue One, the first spin-off movie set in the Star Wars universe but occurring outside the main franchise. These movies focus on the same Star Wars fictional history, but don't centre on the Skywalker family and the central storylines from the main films.